On Saturday, 5 November Lama Jampa Thaye taught a textual teaching and bestowed an initiation in London, hosted by Sakya Dechen Ling. In the morning Lama Jampa taught Jetsun Drakpa Gyaltsen's commentary on Parting From the Four Attachments (Zhenpa Zhidral) and in the afternoon bestowed the initiation of Manjushri. The particular initiation of Manjushri which Lama Jampa bestowed confers the authority to practise the meditation based upon the famous ‘Ganglo-ma’ praise to the deity. This practice is especially helpful for those seeking to acquire authentic wisdom through study of the dharma. 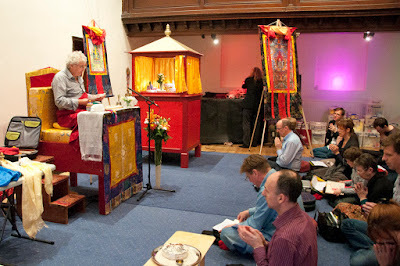 After giving the initiation Lama Jampa also transmitted the reading transmission (lung) for the sadhana associated with the initiation and gave a short overview of the practice.